Moomin World is a theme park for children. The park is based on the Moomin books written by Tove Janson. It opened in 1993, and can be visited from mid-June to mid-August. The park is on the island of Kailo, near the city of Turky, south in Finland. 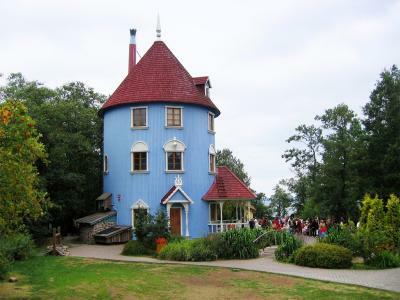 The moomin house is one of the main attractions. is blueberry-colored and all five stories are open to the public. It is also possible to visit several of the other well know sites from the books, and it is possible to meet the characters from the books when walking around.